This is a guest post/warning from someone I hold in high regard. His name is Jim Gardner and he writes the blog How good is that? he also co-hosts the Fundamentally-Flawed podcast. This letter comes on the heels of an issue that has stemmed between him and a very popular Christian Apologist by the name of Sye Ten Bruggencate. This issue may at first glance seem like an issue of Christian vs. Atheist, but in fact this boils down to an attempt by Sye to make money off of modified sound bites that he was expressly told he had no permission to use. I encourage you to read it and if you have ever considered buying any product pushed by Sye or Eric Hovind, I encourage you to reconsider and find a more honest person. I wrote this as a forum posting for Justin Brierley’s Premier Christian Radio discussion forum, but there is a waiting time for membership approval, so I’m making it available here as well. Please pass it on. I realise it’s quite long winded, but it’s important we set the record straight regards an important matter and I’d like to think that this is something which those of us who are both non-religious and those who are not on the extremes of Christianity can help each other raise awareness of, in the interest of clarity and an open exchange of information. I welcome your feedback in the comments section below, but can I also ask that if you are a member of http://www.premiercommunity.org.uk/forum/ that you post replies there as well, so as many people as possible can read and respond. Thanks! Hello! I wanted to start by saying that I admire Justin’s evenhandedness on the podcast, and his willingness to engage with people who fundamentally disagree with him on issues which are clearly very important to him. I hope, as I learn more about other Christian contributors here, that he is not alone in this regard, and that we can have a civil and polite debate on a range of topics. Some internet forums, open to debate between atheists and the religious, tend to fall apart pretty quickly, but I hope to discover that this one stands in-line with the general theme of the radio show, and treats all points of view with respect, and intellectual honesty. With that said, I hope what I’m about to say doesn’t cause any unnecessary ructions, because I would like to issue something of a warning about a scam which myself and some friends of mine, who produce the Fundamentally Flawed podcast together, have unearthed recently, which we worry might affect some Christians who aren’t aware of the backstory, which I’ll attempt to flesh-out here, as best I can. The main reason I want to make it absolutely clear, before going any further, that my being non-religious has nothing whatsoever to do with my genuine concerns, is that the scam does involve some of the religious terminology used in Christian apologetics, which it is necessary for me to use in my analysis of the scam, and in order to explain the problem. This might be seen by some as rude, or disrespectful, given that I am an atheist and proud of it. But this is not my intention. I simply want to help honestly motivated, ordinary people who just so happen to be Christian, avoid being ripped off — and my views on Christianity, as a whole, are neither here nor there — at least for the time being. Being that it is my main worry, that the vast majority of honest Christians might be victim to this scam, there is a lot of misinformation being put “out there” on my true position with regard certain types of apologetics, which the people who are responsible for this scam would dearly love for the wider Christian community to think me and my friends are “running scared from”, presumably out of some sort of worry that their argument (or lack thereof) might hold a degree of intellectual merit which we are incapable of exceeding to. To be clear, it doesn’t, and we aren’t. But with your kind indulgence, I would like to explain exactly why this is the case, as well as explain some of the possible reasons as to why some of these individuals are bearing false witness about us. Chief among the possible explanations for this campaign of misinformation, is that the particular brand of presuppositional apologetics we believe people are being duped into accepting, rises and falls on a provable falsehood, which they would prefer ordinary Christians like you didn’t know about — least of all in the words of a “dirty atheist”. I would like to think that the fact we refuse to go away quietly, having uncovered this scam, has begun to have an affect on the profit margins of those who propagate this lie. What’s rather more likely to be true, is that we have begun to affect the tone of emails which these scammers are starting to receive from other Christians — which might also go some way towards explaining the amount of lies and historical revisionism, which some of you might have seen in the blog-o-sphere and beyond, in relation to our involvement in this story, which these people are largely responsible for producing. To clarify this once again, I can assure you, it is not the case that we disrespect, or “hate” anyone with genuine religious convictions. We are simply concerned that these people appear to be targeting emotionally vulnerable people in their recruiting program, and are clearly drawing them into a distinctly un-Christian type of cult, for which only other Christians can help their fellow believers avoid — hence this bipartisan appeal. Several month ago now, when our little podcast was still finding its feet, we received an offer from a certain Eric Hovind, to debate him in a joint broadcast between our podcast and his ‘Creation Today’ radio show — which is a part of his multimillion dollar, tax free ‘ministry’, based in Pensacola, Florida. Some of you might be familiar with Eric’s father Kent Hovind, who was convicted on several counts of tax evasion in 2007, after leading a ministry which encouraged adherents of the predominantly rightwing homeschooling community to teach anti-science and young earth creationism to children, under the brand-name of ‘Dr. Dino’. It would later transpire that “Dr.” Hovind’s credentials as a dinosaur expert were purchased from a diploma mill, after the Wikileaks website published a copy of his doctoral dissertation, which was written in the first person, contained numerous spelling mistakes, and listed zero evidence-based citations. Tentatively we agreed to debate Eric on the explicit understanding that none of our comments would be used out of context, or edited in such a way that we appeared to say something which we hadn’t said. This was stipulated after several bad experiences with Christian radio hosts far less honest than Justin, in the past, who had literally removed large sections of audio, from appearances I had made on their shows, so as to doctor what I had said to make is seem as if I was rather less well informed than I am on certain arguments. It’s at this point I should clarify that for the first 17 years of my life, I was a born-again Christian, whose journey towards atheism began one day in church, when the sermon was given on Jesus throwing the money lenders from the temple, before the collection plate was passed around. I would later learn that this money was used to launder Mafia drug money through the Vatican bank. But I digress. We were aware that Eric had attempted to distance himself from some of the things his father became infamous for preaching, and fully intended to take him on face value. But we were also aware that if we hadn’t made the stipulation that we would not mute anyone’s microphone, or edit their comments in post-production, he might seek to profit from our comments in a way which ran counter to our beliefs about open information, and a free exchange of ideas. In that vein, we also made it clear that we would be giving away a free complete audio recording of the debate, via our website, and did not seek to make any money from it in any other way, such as by placing Google adverts or other co-branding on our website. Eric seemed happy to go along with this at the time, as an off-air pre-show recording we have of him, which we did not (yet) publish, fully confirms. When it came time to record the podcast, Eric introduced us to a friend of his named Sye ten Bruggencate. It turned out that Sye knew rather more about me than I knew about him, and that he had previously posted comments to numerous religious articles on my website. At the time I didn’t immediately connect his name to the same Sye who had used my blog, and it wasn’t until what unfolded next that I began to recall the particular type of aggressive tactics which he had used, when posting blog comments under the username SyeTenB. The conversation quickly took a very bizarre turn, when Sye started asking a series of questions for which there were no right or wrong, affirmative or negative answers, while insisting that, in-fact, we must answer them with definite ‘Yes’ or ‘No’ replies. This was made doubly confusing when he also refused to acknowledge that, for this very reason, he was just as incapable of answering his own questions as we were, if these black or white criteria were imposed upon him as strictly as he insisted they were upon us. Even stranger still, Sye seemed to believe that this constituted some kind of strength to his position, when to any dispassionate observer it was clear the opposite was true, and that all he had succeeded in doing was to confirm many of the “crazy Christian” stereotypes, which so many of the well intentioned religious have fought so hard to dispel over the years — which we have always fully acknowledged, and welcomed. It’s was at this point in the recording, when their true modus operandi became apparent. Far from having any legitimate interest in knowing what we, as atheists, felt about “life, the universe and everything”, it became clear that all they were actually interested in doing, was capturing as much audio as they could, so as to do to others what they would not have done to themselves. They began pressing us even further on meaningless psychobabble, such as “is it possible that everything you think you know could be wrong?”, and “how do you know that?”, whenever we made any statement which requires longer to explain than the 10 second window which was opened to us, before one or the other would close it again by interrupting us with the next line of their pre-rehearsed script — which seldom bore any relationship to what we had just said. To these specific questions, I lost count of how many times I explained why answering ‘yes’ wouldn’t encompass my true position, anymore than answering ‘no’, but Sye pressed on regardless, seemingly oblivious to the fact that if I were to ask him the self-same questions he was asking me, his answering either ‘yes’ or ‘no’ would paint no truer picture of his faith-based position, than it would of my evidence-based worldview — another of those awful “in-speak” phrases which Sye seems to believe means “assumption without evidence” when spoken by others, but “unquestionably true” when spoken by him. 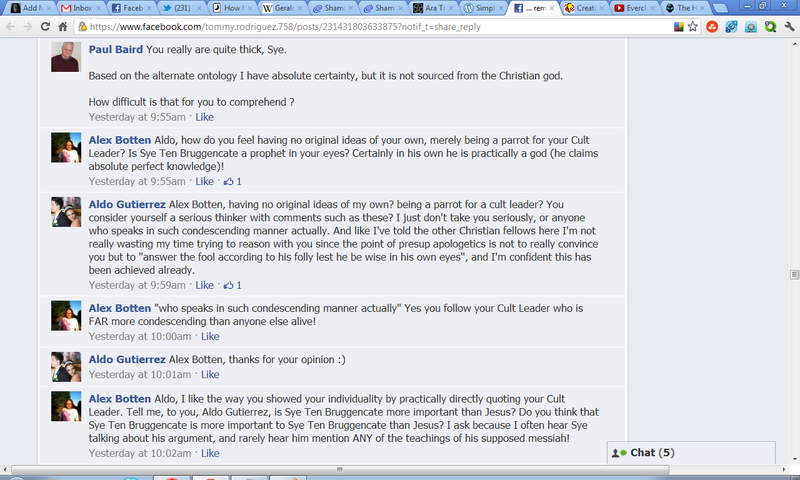 Sye’s one and only response to this, was to repeatedly assert that his position is valid, regardless of his ability to adhere to his own arbitrary rules of engagement, because, as is it claimed, he has had it privately revealed to him that the bible is word-for-word true in a way which cannot be objectively demonstrated, but which he knows for certain to be unquestionably valid. When he was reminded that this “claim to know” is extrinsic and unfalsifiable, we were told that in our basic unwillingness to lower our standards of proof, merely to encompass his fundamentally self-contradictory worldview, that we risked being tortured in the fires of hell for all eternity. So much for peace, love and forgiveness. No-one, dear friends, expects the Spanish Inquisition — least of all in what was fast becoming a distinctly one-sided conversation, in which he seemed to feel entitled to throw out every appeal to authority fallacy in the book, while we were mysteriously limited to his distorted view of what atheists (all of them, mind you) do and don’t “believe”. But the deception, and dark hilarity, didn’t end there. Once the recording was published, we began to take feedback from our listeners, and discovered that the essential core of the method they had been using, was first proposed by Cornelius Van Til in his “doctrine of the ontological Trinity” — which was almost immediately rejected as meaningless by contemporary theologians and philosophers of the time, as being no more that a conclusion drawn from its own proposition. This was later clarified by the first Vienna Circle of Logical Positivists, in the early 1920′s, and the father of scientific falsification Karl Popper, who asserted that all metaphysical truth-claims are “essentially meaningless”, when they contradict the validity of that which is immediately observable — or, ‘The Logic of Scientific Discovery’ to you and me. Because of this syllogism at the heart of what is known as the Transcendental Argument for the existence of God, it is a method of apologetics which has been largely abandoned by theologians of all persuasions for many decades — save for a very narrow band of Americanised evangelicals, renowned the world over for their particularly belligerent insistence that TAG is a rather more substantial argument than it actually is. If we had known this prior to “debating” Sye and Eric, the conversation might have turned out differently. But because we were completely unprepared to encounter someone so ready, willing and able to stoop to new lows in an already strong field of intellectual dishonesty, we had no choice but to notch it up as a “win” for them, and a much needed visit to the library for us. What we would uncover, in that learning process, is that a band of anti-science activists, who are loosely affiliated with everything from supermodel-endorsed anti-vaccination, which has resulted in a ten-fold increase in cases of measles, mumps and rubella in some of the most developed nations in the world, to a type of global warming denial which is largely backed by the same oil and gas giants who fund the Republican party, are attempting to revive this type of presuppositional Christian apologetics, as part of their “war on atheism”. But don’t let the ‘A’ word fool you. This is an all-out, politically motivated attack on rationalism, science, intellectual honesty, and everything which most ordinary people, Christian and non-Christian alike, would consider to be basic common sense. Moreover, Christians who see the problem with this type of non-reasoning, are just as much of a target for misinformation and ad hominem attack, as we non-religious are all too used to experiencing on a daily basis. We had, in other words, inadvertently found ourselves on the receiving end of an elaborate set-up, architected by two of a small but vocal minority in American evangelicalism, who specialise in producing misinformation and propaganda against anyone who just so happens to hold themselves to higher standard of proof than belief for belief’s sake. A few weeks after this first encounter, my podcast co-host Alex Botten, invited Sye back onto the show, to talk about what we had learned about the TAG argument in the intervening time. What followed was a piece by piece dismantling of Sye’s entire position. He simply couldn’t account for any of the things he had previously attempted to bully us into believing he could in-fact account for. At one point, in response to the fact that TAG is syllogistic and logically fallacious — precisely because it assumes the existence of Yahweh according to the same criteria which could be used to postulate the existence of myriad other gods (the existence of which Sye is as atheistic towards as we are towards Yahweh) — Sye simply began babbling even more incoherently than he had before. The pace with which he went from being absolutely certain that he can “prove God exists”, to churning out every logical and informal fallacy in the book, was astounding. Here, before our very ears, was the man who runs a website called proofthatgodexists.org, falling apart like a Taiwanese Rolex on Boxing Day; literally tripping over his own tongue, and in relation to some of the most basic problems inherent to the very nature of his own truth-claim. He simply had nothing left. The mask had been removed. This clearly irked Sye — for what happened next stands as clear an example as any I can think of, as to why legitimately motivated Christians such as you, the sexually attractive and might I say rather dashing reader, should be as cautious of, as we on the opposite benches had to find out the hard way, for ourselves. We began to hear rumours that Sye and Hovind intended to break our agreement not to commercially exploit the audio recordings, of our conversations, and that they were planning to release a DVD of our “debate”. Sadly, we found out too late that there was a precedent for this, as they had also done a similar thing to another blogger / podcaster, who would later become a friend of mine, named Paul Baird. When asked directly about this, both Sye and Eric simply remained silent. Days passed and no emails or twitter messages were replied to, or even acknowledged. This, against the backdrop of the story of what happened to Paul Baird, began to paint a very disconcerting picture, which we then had no choice but to respond to, in the absence of any contact from Sye and Eric, to either confirm or deny that these rumours were true. Paul had found that a debate he recorded with Sye was being sold on Sye’s website for $19.95 a pop, and was disappointed to find that Sye had told Justin Brierley, who made this recording, that Paul had given his full permission for it to be made available as a commercial publication. In reality, Paul had made no such concession — he simply hadn’t been asked, and so Sye simply lied when Justin asked him if Paul had given his permission for the recording to be used. Then an edit of our conversation with Eric and Sye appeared on YouTube. Bearing in mind that we had specifically said our comments were not to be edited or used out of context, alarm bells began to ring that Sye and Hovind might be planning on doing to us what they had done to Paul Baird. There’s some considerable disagreement at this point, as to why Eric posted this edited video to YouTube — with Eric claiming that it was simply to demonstrate that Alex Botten had said something which he later contradicted, despite that Alex was later able to show that Eric had indeed used these comments out of context. Eric, in a later Skype conversation, was told in no uncertain terms, that if he planned on releasing any further edited recordings, featuring our comments out-of-context, we would take legal action. To date, and to the best of our knowledge, Hovind has not released any recordings which breach our verbal agreement to this affect. Fast-forward several weeks. Sye had been told in a series of email exchanges that he would be welcome back onto the podcast, as and when he felt ready to explain the basic contradiction inherent to his own position — i.e., that he claims to have proof that Yahweh exists, while refusing to accept that this is either a fundamental contradiction of his insistence that he holds a faith-based position, or he simply doesn’t understand the basic definition of words like ‘evidence’ and ‘proof’. Sye’s explanation for this basic contradiction, is to insist that he holds both positions in a way which is “virtuously circular” — an unintentionally amusing punchline to a bad joke first mooted by Greg Bahnsen, an influential Calvinist philosopher, and apologist, who wasn’t unaware of the logical inconsistency in claiming to hold two completely contradictory positions on Yahweh’s basic existence at the same time. Sye now appeared ready to confront this problem head-on. From the very moment Sye’s Skype call to record his third appearance on the podcast began, he was reminded that we did not give our permission for any of the audio to be used in a commercial setting, or used in any other way, including in YouTube video clips which might accrue a share of Google’s Ad Revenue, or as part of any third party religious ministry. He was then asked directly if he was finally ready to present evidence of Yahweh’s basic existence — to which he replied, “I already have”. Aware that this was more of the same “cart before the horse, abracadabra, proof of the bible is in the bible” playground nonsense which, remember, we had already told Sye we would not stand for, he was once again invited to present his claimed proof that Yahweh exists. Now, faced with the fact that he did not have our permission to commercially exploit the recording for his own financial gain, and that he had finally been held down to a very specific question with regard to his own basic truth-claim, he simply ran away — literally quitting Skype in a hissy fit, befitting a spoiled child. No-one has ever said that Christian organisations shouldn’t be entitled to produce media which presents their case for God. Indeed, some of the high production values in editing, computer animation and sound design, which many of these productions employ, is a clear indication that there is a great deal of money to be made from releasing these type of instructional videos and lecture series presentations. What we do take great objection to, is when these videos are promoted on the back of comments which the producers have been specifically told they do not have permission to use for commercial purposes. So when a promotional video, for an upcoming DVD from Crown Rights Media appeared on YouTube, and posted to Sye ten Bruggencate’s channel, featured an edited portion of the very same recording in which he was specifically told he did not have our permission to use our comments for commercial purposes, you can imagine that we were distinctly unimpressed. Sye appears to believe, that a recording in which he was held down to a very specific question relating to his own worldview, which he refused to answer and stormed off the recording session when pressed, somehow represents us “running scared” from his particularly nasty brand of pseudo-apologetics. Such is the down is up, up is down, through the looking glass nature of Sye’s entire worldview, one can only presume that by that same internal logic, a recording of us refusing to answer any of his questions, and storming off in a fit of anti-Christian hate speech, would constitute a “win” for the Richard Dawkins brigade — who think that “atheism” is best served by being as offensive towards people who don’t deserve it as possible. This, dear reader, is not the type of non-believer we represent. Yes, we crack the occasional joke about priests and altar boys, and yes we make clear our disgust at the crystal danglers and homeopaths, but the “something out there” openminded religious, who don’t think that religious belief starts and stops at believing in things which are not true, and insisting that other people believe in this kind of nonsense too, simply aren’t on our radar — indeed we regularly complain about that narrow-minded type of atheist, who behave with disrespect towards the religious in this way, and knacker-up the whole deal for the rest of us. Since being asked, repeatedly, to remove media which he does not have the right to use, from YouTube, Sye ten Bruggencate has consistently lied to Crown Rights, and their supporters, about the nature of our involvement in the promotional video which he produced against our specific permission to do so — to the point that, at one stage, he even appeared to deny that he had edited out the parts of the albeit very brief conversation, in which he was specifically told he could not edit our comments, or use them on YouTube, or use them in promotion of a commercial product. Then, when the full unedited recording of him being told exactly this, was posted to Crown Rights Facebook page, a certain Marcus Pittman, of Crown Rights, removed the 70 plus-long comment thread which followed this unambiguous evidence that Sye ten Bruggencate had simply lied, exactly as he had with Paul Baird and the host of Premier Christian Radio’s ‘Unbelievable’, Justin Brierley — saying, as a justification for this clear attempt to silence the facts, that I was “being annoying”. Think about it. “Annoying” for proving that someone is lying to your face, but “virtuously circular” for claiming to have proof that Yahweh exists, while refusing to present any evidence of it. These people, dear readers, are not your friends. They are not even your fellow Christian. They are scam artists, who for $20 a go, promise you everything and tell you nothing. Do not be deceived. Please do not do make the same mistake we did, and have anything at all to do with these provable liars. They will rip you off, they will lie to you, and they will lie about you if you have the simple temerity to question their motives. Please, be warned. They are far more of a threat to your image, true beliefs, and motives, than anything the vast majority of atheists like me would, or could seek to impose upon you. Thank you for your time. Jim. Christian Apologists – Acting the Fool? Proverbs 26:4 – Do not answer a fool according to his folly, or you will be like him yourself. So what this tells me, and if you think this is wrong I welcome comments to explain why, is that Christian Apologists are acting in direct opposition to this statement, which from what I have been told is acting in direct opposition to their God. So maybe Aldo is wrong here? Maybe he didn’t quite think his comment through before posting it on Facebook and allowing the interested world to see it. Aldo is following this command, kinda (but we won’t get into how he is violating this), but he is pointing out that his Apologetic friends are following Proverbs 26:5 with blatant disregard to the passage right before it. Let’s take a quick look at this, remember I have not read the complete bible, but I do know that Christian Apologists believe in the Law of Non-Contradiction, meaning A cannot be A and not A at the same time. Proverbs 26:5 – Answer a fool according to his folly, or he will be wise in his own eyes. So as a person that sits outside of the Theist/Atheist argument this seems kind of counter-intuitive, to say “don’t answer… according to his folly” then in the next line say “answer according to his folly…” is pretty confusing. Now mind you I took both of these passages from the NIV version of the bible, because it is commonly quoted by the Christian Presuppers, and as a non-Christian I have to rely on the use of the common argument to base my opinion off of. So what is it Christians, do you answer according to his folly or not answer according to his folly? Having both statements back to back seems like you are stuck between a rock and a hard place. You are currently browsing the archives for the presuppositionalism category.